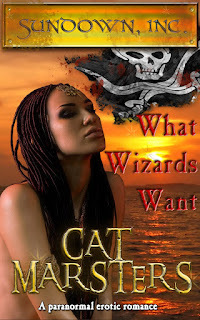 Cat Marsters: Out now: What Wizards Want! 1. You don’t need all the proper crystal ball-type props to do real magic. Although things can get kind of interesting when you improvise. 2. There is no wizard academy full of jolly thrills and spills. You get pushed in at the deep end, and only the really lucky ones get a nose plug. 3. Faeries like wizards. The same way that humans like pack mules - except we’re way kinder to pack mules. 4. We’re not immune to a shapely female form, although sadly, they’re not as available as I’d like. 5. Sometimes — just sometimes — we get things wrong. And when we do, the results can be pretty spectacular. What Wizards Want: How many pirate queens have you freed lately?